In an age that health consciousness is on the front burner, experimenting with any of my sweet tasting 23 raw vegan kinds of soup will be an immense delight. If you enjoy the healthy, tasty and delicious edge of vegetables, then you are on the right page with this outline of vegan recipes. As a chef and food reviewer over the last 15 years, I can safely tell you that you are in for a treat if you carefully read through this article. I have included my favorite vegan delicacies alongside recommendations from some of the most decorated chefs you can find on the planet. The edge of these 23 raw vegan kinds of soup that will make you salivate in the flexibility to have them served cold, warm or chilled. Most of the ingredients are easy to find in your local grocery store, and the ingredients are acceptable in several climes across the globe. You are assured of a bust of energy and vitality after getting a treat of any of these delicacies. They are too easy to make! All you need is a chopping mat and you are all set! You won’t even need an oven mitt because you’re not dealing with heat! Watermelon and summer barbecues have an alignment that makes this recipe a delight if served chilled at home or out there at the park. The sweet taste of watermelon with its succulence makes it a soothing delicacy that your body will relish on a warm day. The refreshing edge of the soup will combine with the watermelon’s sugary effect on your taste buds to complete the tantalizing treat. You can enjoy the near-instant peanut soup with its rich vegan and raw greenness in any weather. You can decide to serve it cold when during warm months or have it hot in cold weather. It is easy to prepare as you only need to use your blender on the peanuts, add your green option and some water to even it out. In 2 minutes, it is yours to savor! Irrespective of the weather, this yummy coconut curry soup comes with an amazing taste you can’t resist. Ingredients like chili, garlic, and curry make it savory with a sweet sensation. The walnut soup is a summer delight that fits perfectly as a light meal. It originates from the Persians and has been vegan-modified by swapping creamy coconut milk for the traditional yogurt content. You will lick your mouth from this creamy delight after tasting it once, time and again! This vegan delight is served at body temperature, and it does not have to go along with a cold salad. When the chili comes warm and with cacao tipping, it’s ready to be served. You can have this soup ready to eat in 10 minutes. What you need to do is to blend your greens so that the stems get mashed and ready for digestion as soon as it gets through your throat. You can be assured of instant nourishment without having to beat up by the stove for a long time. A mix of curry and butternut squash gets this recipe turned into a meal which you can serve cold or warm as the situation demands. You can choose to freeze it and have it served when next you need it. When poised for a meal to help you get past the weather and boost your immune system, then this meal prepared from homemade almond milk, plenty coriander, lime and fresh garlic, will give you the needed shot. It is bursting with unmatched flavor and easy to prepare. It is one soup you can make with the ingredients in a bag when visiting a friend, loved one or family. This recipe is a merge of 2 in one delicacy. The soup is filled with greens and alive with lemon and short for balanced flavor. It is ideal for health, and if you are steeped to consume more greens regularly, this should show up more often on your menu. The greenness of kale is unmistakable but a good coloring for the avocado salad. Then smoky chipotle powder gives this recipe the kick that makes it standout as a delicious treat. This soup is perfect for the changing season from summer to fall. It has no oil and utilized nut-free gazpacho for excellent taste. Mushroom soup is a medley scape made out of elegant mushrooms that suffuse the soup with its pristine flavor. It is an exquisite recipe that is a sure bet when your mushroom is fresh from the farmers’ market. Anyone who loves the delicious flavor of smoking tomato and corn chowder will treasure this treat. It comes spiked with spices in generous proportions. This recipe is credited to Nouveau Raw where Amie Sue holds sway. Lemons will unveil the flavor of baby spinach with it's tangy and tart contents in this Kerry Ogden’s delicacy. This soup offers you creaminess that is perfect when spring calls. Complete with Bell Peppers, Spices, Onions and garlic, raw soups of this ilk are yours to enjoy at short notice. They will help your digestion, and they remain a healthy treat with a mix of cloves, onions, cumin, coriander and tomatoes to make it sizzle. Unveiled by Emily Von Euw, your taste buds are in for a treat with this recipe. When you assemble smoked sea salt, chipotle, cumin, garlic, and onion, you have this raw delight that is free of legumes and nuts. With dipped dried golden berries, the spicy and peppery flavor is moderated to enhance your enjoyment of this recipe. It is Marquis Matson of Raw Kitchen that patented this tasty delight. If you put too much salt, just add a few more ingredients to make your soup it less salty. Blended with Avocado and Dill, this soup is sweet, easy to cook and deeply satisfying as a raw soup. Ingredients include fresh tomato and combine sweet corn kernels in a creamy mix of hemp seeds and walnuts. Served with lemonade in a tall glass, the summer garden gazpacho can be delightful with avocado spread and toast by the side. This delight for Summer‘s end when the farmers market is overflowing with fresh ingredients, you will love every taste of this delicacy when served cold. Your guests will be tantalized if served this eye-catching soup with its raw delight. It is healthy and more than a mouthful for your taste buds. This raw recipe is simple to prepare and delicious to taste. Buzzing with Vitamins A and C as a result of the Ball peppers, it is an excellent addition to your menu across the seasons. It is a meal that supplies your daily requirement of the C and A class of vitamins. Served raw, this tasty pick is yours to enjoy with a blender in place, a fruit juice by the side and vegetables to complete the mix. Your raw soup will get warm in 10 minutes if placed on the dehydrator as required. The pea soup gives a different meaning to your usual sauces and dressing ingredients. Herbs, salt, spices and water with some nut based creamy dressing will complete the base for this recipe. Some garlic sauce will put a spin on this soup that you will relish. Using parsley pistou with its vibrant green gusto as a topping for paprika infused with red bell pepper will give you a tantalizing soup of nutty texture. A treat you cannot forget in a hurry, it can be served as an appetizer for dinner or lunch or as a meal by itself. Coconut meal gives a rich dose of calcium and healthy fats that your body indulges for healthy living. It is an easy -to-make meal, sweet and richly satisfying. As a result of its lightness and indulgent appeal, many will complete the second bowl before they realize it! Fashioned in New York City, Gena Henshaw holds the ace as the creator of this wonderful recipe in all its richness. If you enjoyed reading this piece and have gone ahead to prepare one or two of the delicacies, then you have added to my fulfillment as a chef and meal reviewer. 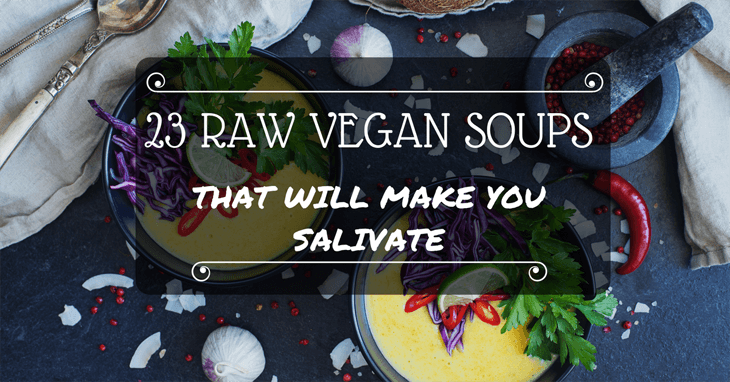 The range of 23 raw vegan kinds of soup from my experience are a huge delight that isn't just nourishing, but healthy to be consumed by all and sundry. Free of animal condiments, even the most ascetic being will enjoy these vegan recipes. Please add your comments on this page and feel free to share this article with friends who love vegan meals. Any fan of healthy living will have an exciting time reading through this piece.